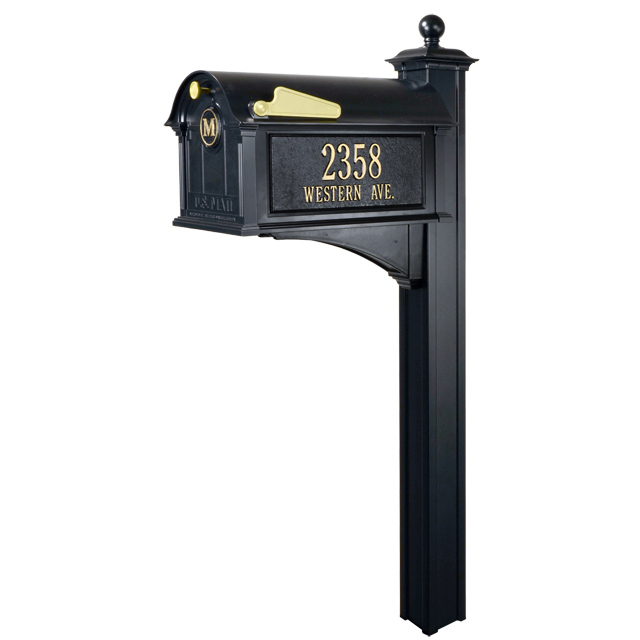 The Balmoral Mailbox Package includes a beautiful post mount mailbox adorned with your monogram, two personalized side panels, mailbox post and brace. It provides stunning entry decor while combining classic lines with super functionality to handle all of your incoming and outgoing mail. The mailbox measures over 2.2 cubic feet. The Balmoral Mailbox has more than 3 times the capacity of a standard mailbox. The durable aluminum construction includes a lifetime limited warranty and the weather resistant powder coat finish will keep the Balmoral Mailbox looking great for years to come! Dimensions:Mailbox: 13-1/2"W x 21"D x 13"H, 16 lbs. NOTE: Post requires a 4" x 4" treated lumber piece for installation - this is not included. Material:Die cast, rust-free aluminum and finished with weather-resistant powder coat paint. Note: Assembly required. Drilling will be required for mounting of address plaques. Note: Free Shipping applies only to products annotated as Free Shipping and shipped within the 48 contiguous United States. International Customers - Contact Us for a Shipping Quote.